Key Input Length in mm. Key Output Length in mm. Whippen Input Length in mm. Whippen Output Length in mm. Hammer/Shank Input Length in mm. Hammer/Shank Output Length in mm. Action Ratio (or Distance Action Ratio) can be defined as: Distance of Hammer Travel to Let-off divided by Distance of Key Travel to Let-off. Or, Hammer Output divided by Key Input. David Stanwood to the understanding and improvement of grand piano actions. This Action Ratio Calculator is based on Nick Gravagnes Geometry Program (which I highly recommend) as well as the 6mm. Dip Block stub on a block spanning 5 white keys Action Ratio Method (picture) described in Bill Spurlocks excellent white paper on Grand Action Touchweight. Nicks program (www.gravagne.com/action.htm) is really helpful in that it details 1 to 3 methods where one can measure replacement parts before mounting and get an idea of Action Ratio and other relationships. Of course, parts should always be mounted, regulated, and tested to confirm. The program also has tons of additional action geometry information and tools on methodolgy, Hammer Blow, Dip, Hammer Weight Impact, Hammer Bore, Hammer Bore Angles, and more. Also, as of 05/20/2013, word is that Nick may have a program upgrade is in the works. It's like having Nick right on your desktop. Bill Spurlocks excellent white paper (Grand Action Touchweight) describes the 6mm. stub method in detail for determining Action Ratio as well as covering almost everything you might also want to know about touchweight. Note: It is prudent to measure several notes and get an average using this method. After extensive testing on a Steinway L 1941 Accelerated Action, it appears that the Gravagne "Simple Method" of measure yields about a .4 to .5 higher Action Ratio result than using the Spurlock described Action Ratio Method. (also see Demo Data discussion below) In fact, Nick states that "if anything, the Simple Method is pessimistic --- it yields a lower force leverage, and a higher distance ratio" than his other methods. The calculator on this page uses a slightly modified Gravagne "Simple Method", plus a small "tweak", that yields an Action Ratio result that more closely matches a result derived using the Spurlock described method. This was done as a convenience for those who may be more accustomed to using the Spurlock method and their associated desired target Action Ratios. Keep in mind that, to date, the above calulator has only been tested on two grand actions. I hope to measure more actions in the future. 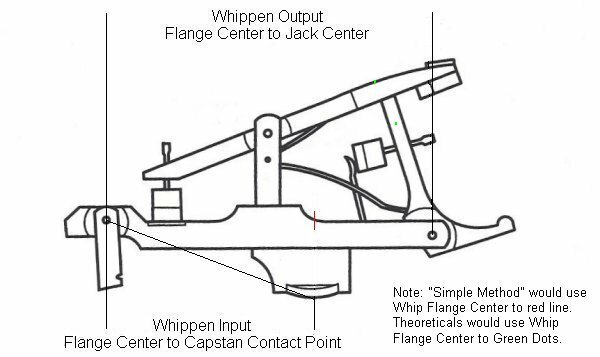 Note: Whippen input is Whip flange center to Capstan contact point instead of the Whip flange center to vertical point of capstan center line ("simple method"). There is also a "Theoretical Method" (picture) of measuring action parts posited by Baldassin, Robinson, Gravagne, Davenport, and others over the years which I find seems to yield an Action Ratio of about .75 lower than using the Spurlock method. One of the great things about any calulator is that one can instantly move a knuckle or capstan and get a reasonable idea as to change in Action Ratio before mounting parts and testing. Currently, I wonder what method will actually yield a true "Action Ratio". I believe all methods yield an approximation but results will be different depending on method. As a further proof of this, let's consider yet another method: Set a hammer blow distance of 44.45mm. (1 3/4") on a white note. Next, set let-off of this note to block against the string. Then measure the downward key travel in mm. until the hammer blocks to the string. Divide 44.45mm. by downward key travel in mm. and I predict that you will get an action ratio of about .5 lower than this calculator or the Spurlock Stub method and about .9 lower than the Gravagne "Simple Method" (picture). So, a Spurlock 5.6:1 might become 5.1:1 and a Gravagne "Simple" calculation of 6:1 might become 5.2:1. Actually, I find that this method seems to result in an action ratio that is close to the "Theoretical Method" mentioned above. It may be said by some that this is not a valid ratio because it includes distance after let-off but I believe it is still pertinent as a consideration. Again, this calculator attempts to reconcile a simple parts measurement result with that of the Spurlock 6mm Stub method. All in all, the Spurlock method appears to "split the difference" between the the "Simple Method" and Theoretical Method" calculations. So, it appears that different Action Ratio measuring methods may require their own associated target end result ranges. Using the traditional Gravagne "Simple" or Spurlock methods may yield ratio ranges between about 5.0:1 to 6.5:1 that are familiar to many technicians. The Hammer to Blocking condition/Dip at Blocking condition method yields much lower numbers and would likely need a newly defined target range on which to base our parts selection decisions. I have observed that many technicians who use the Spurlock method seek a target Action Ratio of around 5.5:1 Can the Gravagne "Simple Method" allow for 5.75:1 or 6.25:1? Well, all methods also depend on the end result. For example, a key ratio of 2.12:1 (demo data) may tolerate a 15.5 knuckle when a 1.89:1 key ratio will likely not tolerate a 15.5 knuckle. Of course, additional factors weigh in as well. No pun intended. Additionally, the end result on dip and let-off tolerances. Many Technicians (myself included) believe that the Action Ratio constantly changes throughout the keystroke. Some suspect it grows during the keystroke, and others suspect that it shrinks. Perhaps this is why the Spurlock Method is popular in that it gives a good snapshot or average of Action Ratio. I did an experiment that seems to indicate that Action Ratio starts high and ends low (picture) but feel that the "verdict is still out" on this subject. Again, the above observations and opinions are based solely on my limited findings to date. Update: The Demo Data II is a Yamaha Grand and the Stub Block Ratio method measured about 5.66:1, 5.59:1 using this calculator, 5.08:1 using the block to string method, and 5.97 using the Gravagne simple method. Note: I have not had the occasion to do a complete Steinway parts replacement since 1991 so the following is also a conversation with myself. I welcome any feedback. The piano came with 15.5 knuckles, and quite a bit of lead in the keys. I suspect it may have been suffering from "Pre-Vertigris" in the factory. After trying to be careful in my initial evaluation, using the 6mm. stub on 5 white key top block span to measure action ratio, I kept coming up with an Action Ratio reading of about 5.6 :1 using the original repinned but worn hammers as well as with replacement shanks and whips. Plus, with the NYI improved whippen, I actually liked the way the Jack lined up with the 15.5 mm knuckle better than the 17mm. knuckle. I'm now inclined to believe that the above initial readings were on the low side of accurate. Perhaps I did not average. The action "spread" is correct to spec @ 111.92mm. ( 4 13/32"). So, I ordered the 15.5 knuckle placement. Low and behold, after the new parts were installed, and rough regulated, my initial AR measurements (using the stub dip block method) jumped to about 5.86 :1 to 5:9:1. After more regulation, some tuning, and playing in, subsequent, careful 6mm. stub on 5 white key top block span is now yielding action ratio measurements of about 5:75:1. There has been minimal regulation required with the new parts and the key dip was already right at 10mm. I have yet to move a front punching but will be tweaking. So, minimal dip adjustments. Also, minimal let-off and drop adjustments. So, some lower labor cost overall. I think the real saving grace in this particular situation is that this keyboard has a key ratio of 2.12:1. In the future, Key Ratio will be my 1st measurement! I was lucky this time around. I will be removing lead from the keyboard, and would remove more with a 17mm. knuckle, but I also wonder where the bounds of practical and pushing the ideal exist. I'm sure that we all have different opinions on this. Update: During key balancing, I removed > 3.8 lbs of lead from the keys with the 15.5 knuckle installed and regulated. Of course, I can also choose to move the capstans 2mm to get maybe a 5.47:1 ratio and then re-regulate, but I am inclined to leave things where they are at this point. As is, the piano will be about as close to Mfg. Factory Spec as the day it come out of the factory less one or two leads per every key save the top octave. At least no one can claim it's "Not a Steinway". Personally, I don't buy into that argument. At the same time, I certainly believe that better than Factory Spec is attainable. I'm still wondering where I draw the line between the practical and the ideal. Also, the overall scope of a particular project that may affect decisions. Finally, it is my understanding that all New York manufactured Steinway Grands used the 15.5mm knuckle placement from around the 1900s to around 1984. Imagine that. 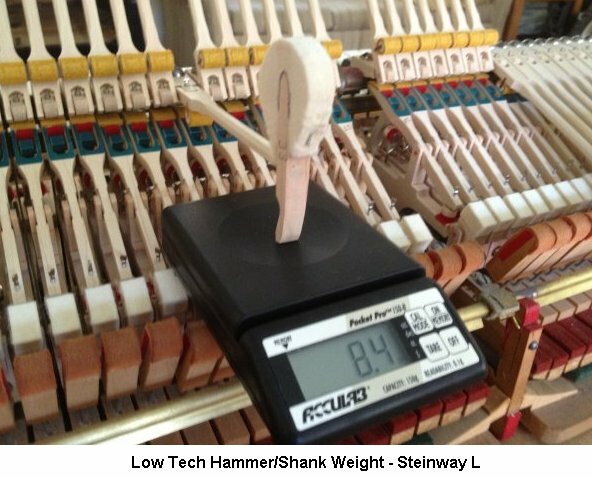 Weight Ratio: While not within the scope of this calculator, The Weight Ratio for the Steinway L appears to be 1:7. That is, 1 gram of additional hammer weight increases downweight by 7 grams. The Weight Ratio on the Yamaha demo data seems to be about 1:6.